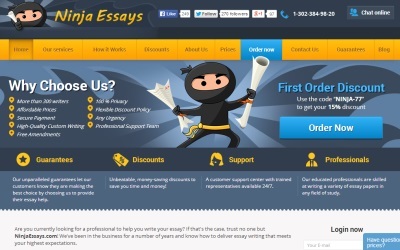 Ninjaessay.com is considered as one of the leading writing agencies working in the field of academic and business writing. Despite the fact it is an US based company, it offers its services online so students from all parts of the world can use their assistance. The writing team of ninjaessay.com is composed from US native speakers only. In order to become members of their writing team, writers have to hold at least Masters degree and have to pass serious examination. The website of this company is very user friendly. It offers information regarding pricing, delivery or writers. This company has several guarantees incorporated in its business policy, and those are: guaranty for top-quality essays, attentive client support, on-time delivery, privacy, direct communication with assigned writer, and 100% plagiarism free papers. Quality level – this company has three quality levels, and clients should choose among them to get the quality they are looking for. These quality levels are standard, premium and platinum. Standard quality has basic good quality, whereas platinum is created for the most complex projects. Deadline – The price can be significantly increased if the client has very urgent offer. It can go from 3 hours to 10 days for essays, or from 12 hours to 2 months for dissertations. Service (paper) type – Each type of service (paper) has its own pricing table. More complex requests are more expensive. Writing subject – Clients who need papers related to engineering or technology should pay more money. For instance, one page of dissertation costs $19.99 if it is written for undergraduate student within 2 months, whereas one dissertation page for PhD student written within 12 hours costs $50.99. On the other hand, writing of one essay page costs $19.99 with standard quality and 10 day deadline, whereas one page with platinum quality and written within 3 hours costs $52.99. This company has two types of discounts. The first one is one-time discount and it reduces the price for 20%. It is created for the first time users who would like to test capabilities of this company. The second type of discount is life-time discount and it reduces the total cost for 5%, 10%, or 15% depending on the total number of previously ordered pages. This company has several additional features whose goal is to increase client satisfaction and to meet requests of the most demanding clients. Those are: VIP support, fulfilled by TOP 10 writers, or professional proofreading. Interested customers can get all information they need 24/7 via online chat, email or telephone thanks to excellent customer support team of this company.